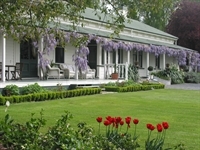 Luxury 5-Star accommodation in the heart of Marlborough’s wine growing area. The property is situated in the midst of an extensive country garden a boutique vineyard and an olive grove. We are selling this business as a going concern for somebody who like to have a good healthy lifestyle and leave the busy rat-race live behind or somebody who let it slip into a real busy business. Whatever you like to do, in the last 20+ Years we have done the hard part of making it well known. After 20+ Years and age 70 we have to plan our next step in our lives before we are forced to do so.